Located in the Jinxiu Yao Autonomous County in the Guangxi Zhuang Autonomous Region, the Mount Dayao National Forest Park covers an area of 500 square kilometers. 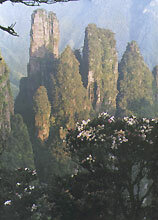 The scenery is extremely beautiful , with rust-colored peaks, green waters, weird-shaped rocks and towering trees. There are 60 peaks over 1,300 meters. Viewing then from a distance, the peaks are surrounded by mist and clouds; going close to them, you will be attracted by stone pillars, peaks piercing the sky, rushing mountain streams, hanging waterfalls and deep, quiet valleys. Mount Dayao is home to 2,353 species of plants, ranking first in all the mountains in Guangxi. All the year round, the national forest Park is full of green trees and colorful flowers, showing a splendid scene of natural vegetation. More than 40 rare silver firtrees grow in the park, some of which are more than 450 years old. In addition, an azalea forest covers an area of nearly 10,000 mu. When the azaleas are in full bloom they look like boundless colorful clouds. More than 170 species of animals live in the park, including many rare species. The average temperature in summer is about 20c. hence it is an ideal summer resort and place in which to enjoy the beauty of nature.